Tarocchi Siciliani - thanoscardgamess jimdo page! This is a card game played with the Sicilian Tarot cards. This variant is played near Messina, in Barcellona Pozzo di Gotto. It is a point trick game in three rounds. Before playing and after the deal, there is a simple bidding process to determine the player who will take the talon. A player may decide to play solo against the other players, or play each for himself. There are points for special cards, tricks and the last trick. 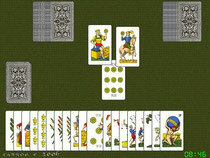 Additional information on Sicilian Tarot games can be found here.